In 1914, Evelyn Northey desperately wants to become a doctor, but her medico father has forbidden it. Undaunted, Evelyn becomes a nurse, just in time to enlist as an Army nurse in World War I. She vows she will never marry - never give another man control over her life. 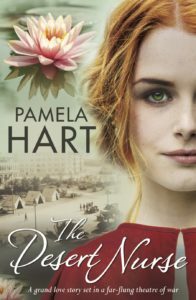 In Egypt, she nurses the wounded from Gallipoli (including Jimmy Hawkins from The Soldier's Wife) and there falls in love with Dr William Brent, an ex-polio victim who believes that his disability makes him unfit to marry. When a friend of both Evelyn’s and William’s is missing after the 4th Light Horse’s successful attack on Beersheba, they must go into enemy territory to ransom him; and on that journey discover their deepest feelings for each other. But can anything change their minds about marriage? The Desert Nurse tells the story of four years which changed the world and all the people who lived through it.